2000; 322 pages. Genre : Urban Fantasy (so sez Wikipedia), or Semiautomagic (so sez Butcher). I like Butcher's choice better. 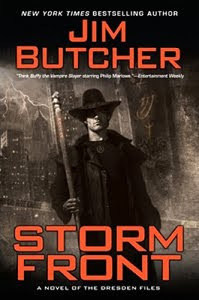 Book #1 (out of 11, I think) in the "Dresden Files" series. Overall Rating : B-. Harry Dresden is a Wizard. He's in the Yellow Pages, where his ad reads : "Harry Dresden - WIZARD. Lost items found. Paranormal investigations. Consulting. Advice. Reasonable Rates. No Love Potions, Endless Purses, Parties, or Other Entertainment." Harry's main activity is finding enough money to pay the monthly rent. Today's his lucky day. A woman wants to pay him to find her husband. And the Chicago police want his professional opinion as to whether any magic was used in a double homicide. Where the hearts of two lovers exploded out of their chests (shattering ribs on the way out) and splotched all over the ceiling. Yeah, there might be a tad bit of paranormalcy involved here. There's a vampire or two. There are black mages and white wizards. There are pizza-loving fairies, and a wise-cracking spirit caged in a skull on Harry's desk. There are slow-witted demons, 6-foot-tall scorpions, some hookers, and some mobsters. There's a strong female police detective named Karrin Murphy. It's a murder-mystery, but with AD&D-ish magic blended in. Spells are cast, but one is never quite sure what they'll do and how effective they'll be. Buzzword for this book : "Thaumaturgy" (pg. 19). Storm Front is Butcher's debut effort, and it shows. There are some trite metaphors, some "roll your eyes" scenes, and some telegraphed plot twists (is that an oxymoron?). For example - he concocts two potions - an Escape Potion (which he has plans for), and a Love Potion (which he has no discernible plans for). Things go awry during a battle with a demon, and he calls for his female companion to drink the Escape Potion. Yeah, guess which one she drinks. Just because you're paranoid doesn't mean there isn't an invisible demon about to eat your face. I picked up this book after Christina reviewed Books #3, #4, and #5 of the series here, here, and here. You can nitpick the storyline to death, but that misses the point that it is meant to be a light-hearted read with an entertaining stream of humor running throughout. Several reviewers say that Butcher gets a lot more polished with each book, so I'm looking forward to reading more from this series. We should include a thing on the sidebar detailing all the really cool buzzwords. "Thaumaturgy" would probably be at the top of the list. Don't have a clue what that means. We should have a contest! I need to pick up this series. heh. i had to look up "thaumaturgy" too. the buzzword in the book i'm presently reading is "raconteur", which is a fancy word for "storyteller". 5-Squared is causing me to look these high-falootin' words up instead of just skipping over them. Yes, I'm having to look them up too.